Yes yes yes technically they’re called cloaks but, let’s be honest, these are capes. 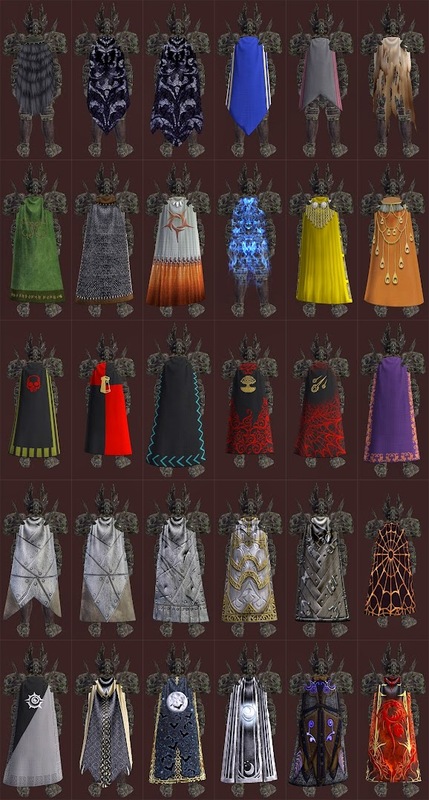 LOTRO has the actual cloaks covered while EQ2 has the hoodless cloaks, or capes. Either way, i love both and make it a habit of collecting as many variations as i can. Sure it may kill my inventory and bag space but i could care less as long as i collect them all! I currently have 30 cloaks sitting in my bag for when i feel the need to change up my appearance. This actually happens quite often as i get bored of the same look every day. The majority (90%) are from quest rewards or drops from dungeons. A few of them i purchased off the broker really cheap and one is a perk from pre-ordering the expansion which drops tomorrow. Unfortunately, and as with every cash shop type MMO, all the best looking cloaks are only available through the Station Cash store. As tempting as some of the models on there are, i’m avoiding them for now. I’m not sure why considering my actual armor skin is from the shop but the cloak will have to wait. Hopefully the expansion has a few more quested cloaks i can add to my collection.